A while back, we introduced the 5-level Google Shopping structure. 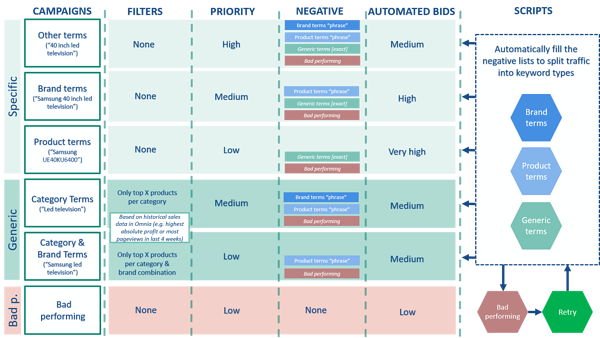 This structure is perfectly adapted to the major differences in performance between generic and specific search terms, as Lupko clearly explained in his blog post. This structure gets the most out of various search terms. It also takes just a few hours to setup, requires little maintenance and can be fully automated. Until now, negative search term lists could not be automated. Thanks to a smart combination of Google Adwords scripts, Omnia data and Google Sheets, this aspect can now be automated as well. In this blog post, we will deal with the way negative search term lists have been automated, and how it applies to the 5-level structure. To understand how the negative search terms can be automated, some background knowledge about the 5-level structure is needed - especially about the dynamic created between the five campaigns through an intelligent combination of the campaign priorities with the negative search word lists. Below is an overview of the 5-level structure and its various facets. If this information is new to you, it may be a good idea to read the blog post about the 5-level structure first. The 5-level structure is well-adapted to the difference in performance between the various types of search terms, and it requires very little maintenance. One needs to devote just a few hours to organise the structure, after which every aspect is fully automated. Ad groups: ad groups are created automatically based on the retailer’s category and brand structure (or the choice for another cross section), and can be paused or activated if the categories and/or brands in the selection change. Products: within the ad groups, the products are automatically added and paused/activated on an hourly basis, depending on the inventory. Bids: the CPC bids are calculated per product based on factors such as product margins, online product conversion rates, and the effect on shop sales (the ROPO effect). These bids are evaluated on an hourly basis, and adjusted if one of the parameters changes. Top X: the most popular products per category and/or brand are identified automatically based on historic sales data in Omnia, such as most profit or most page views in the past 4 weeks. These popular products are then added to the campaigns for generic terms (ex. : ‘LED televisions’), so that these generic terms automatically display the most popular products. The only aspect that has not been automated until now, were the negative search term lists. Maintaining these lists is very time-consuming, which makes it impossible to manually classify every search term. Now, thanks to a smart combination of Google Adwords scripts, Omnia data and Google Sheets, the negative search term lists have been automated as well. Maintaining the lists now requires much less time, and the various search terms are distributed better over the 5 campaigns, which further increases performance. Let us now elaborate on the structure in greater detail. To identify the various types of search terms, a smart combination of Google Adwords scripts, Omnia data and Google Sheets is used. We will deal with both functions in greater detail below. Product terms: all search terms related to a single specific product (ex. : ‘Samsung UE40KU6400’) This lets you know exactly which product should be displayed. Brand terms: all search terms containing a brand (ex. : ‘Samsung 40 inch LED television’). This lets you know that only products from that specific brand should be displayed. Other terms: all other unspecified terms (ex. : ‘40 inch LED television’). Category terms: All search terms for which an entire category may be relevant (ex. : ‘LED television’). Many products may be relevant for this term, but using the Top-X function, only the most popular products in the category will automatically be displayed. 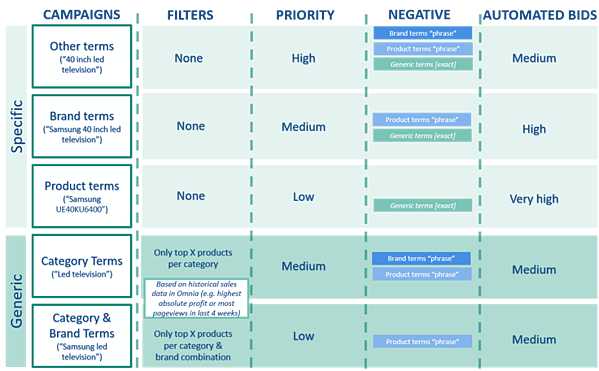 Category and Brand terms: All search terms in which the combination of category and brand may be relevant (ex. : ‘Samsung LED television’). 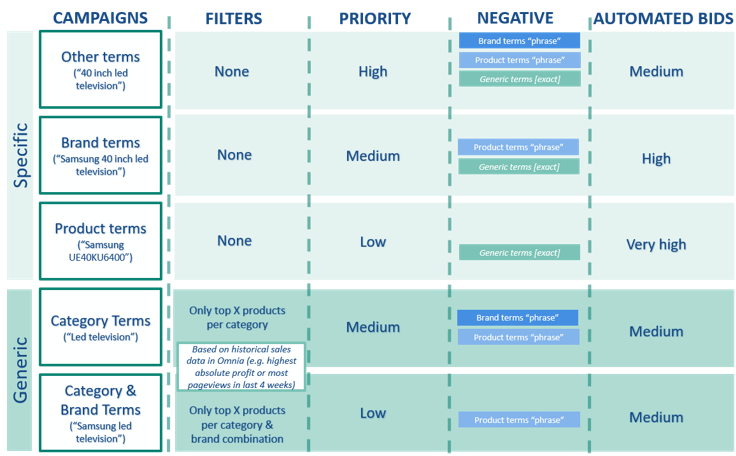 Many products may be relevant for this term, but using the Top-X function, only the most popular products in the category and brand will automatically be displayed. These lists are maintained automatically using three corresponding scripts, which are dealt with below. The brand script is the easiest of the three. The ‘brand terms’ list should consist of a list of all brands that are added as ‘phrase’ negative. This can be achieved easily by constantly exporting all brands from Omnia and adding the new brands to the negative search term list. Adwords will then recognise whether a brand is included in each search term. For example, the brand Samsung can be added as the phrase ‘Samsung’, and all search terms that contain a brand will be recognised, regardless of the position of the brand in the search term: ex. : ‘Samsung 40 inch TV’ or ‘Black LED TV Samsung’. The product terms structure is a bit more complicated. In this method, all search terms are exported to Google Sheets by means of an Adwords script. In Google Sheets, these search terms are then cut into pieces, and each piece is analysed separately. The script recognises the word type for each piece. This can be a text, brand or product number (MPN), an EAN, dimension, specification, or number. If the search term contains an MPN or a specific combination of words, then it is identified as a product term and automatically added to the ‘product terms’ list. The types of words or word combinations can be adjusted per client. This makes it possible to adjust the product term recognition precisely to your branch. For car tyre sellers, for example, it is important to recognise whether the search term includes the tyre size. A tyre size always includes a certain standard alphanumeric combination. The product term definition could then be: Brand + number + tyre size. In this method, the search terms are also copied to a Google Sheet by means of a script. There, the search terms are compared to the brand and category tree for the product on which they are displayed. If all of the words in the search term correspond to the words present in the brand and category tree, then it is identified as a category term. The three scripts above split the traffic into five campaigns, allowing for targeted bids corresponding to the type of traffic. With clearer differentiation between more specific terms, such as ‘Samsung UE40KU6400’, and more generic terms, such as ‘Samsung television’, the return on ad spend (ROAS) of the campaign will increase. As a result, higher bids will be profitable, and more traffic can be generated, resulting in more revenue. However, some search terms still will not perform well. You can (temporarily) exclude them from the 5-level structure. We will deal with this topic in the next section. Despite the neat division into five campaigns, some search terms still will not perform well, for example because of a very low click-through rate (CTR). Another scenario could be that visitors click on a product but do not complete a purchase. You want to exclude both situations. A low CTR is bad for your quality score in Google Shopping, and is a sign that your advertisement probably is not relevant for the specific search term. A low conversion rate will probably be unprofitable, as it requires too many clicks - and therefore higher costs - to result in a purchase. These terms can be excluded by using a bad-performing search term script, and they can eventually be reactivated using a ‘retry’ script. Search terms that meet these limits will automatically be added to the ‘bad-performing’ negative search terms list, and excluded. Neither a low conversion rate nor a low CTR need necessarily be permanent. For example, a product may have temporarily been out-priced, with the result that the clicks and conversions for the related search term during that period went to the competitor. Once the product is priced competitively again, then the same search term may finally become profitable. 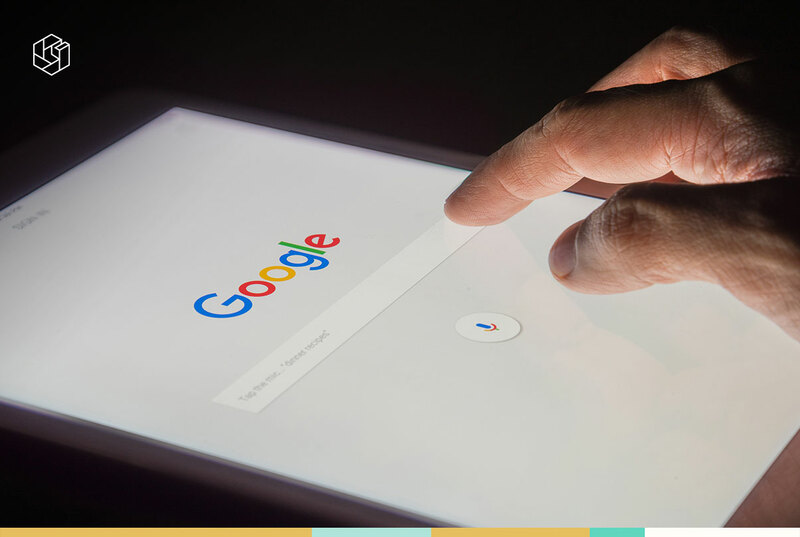 It is therefore crucial that search terms which could potentially be interesting in the future are not permanently discarded. This ‘retry’ option is often overlooked, causing traffic to be gradually squeezed out and putting pressure on the revenue. With Target ROAS strategies, you frequently see that all of the traffic that does not meet the target is switched off, with the result that the revenue will also start to drop off as well over time. For the ‘retry’, Omnia uses a 6th campaign; the ‘bad-performing’ campaign. This campaign serves all of the search terms that are not profitable in the other campaigns. This is done for a low bid, so that the retailer can see if search terms can become profitable again with lower costs. If the terms then reach above a certain threshold, they are removed from the ‘bad-performing’ negative search term list and displayed for a full bid. We ran a pilot with the scripts at various customers and the results have been impressive. The scripts continuously analyse all the search terms and keep improving the traffic split based upon their performance. 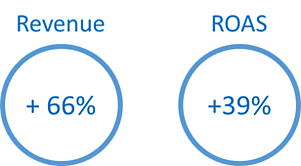 This makes the Google Shopping campaigns more effective and over the first 2 months both the daily revenue and ROAS have increased by respectively 66% and 39%. The 5-level structure gets the most out of the various search terms, and with the automation of the negative search term lists, the last remaining aspect is now fully automated. This is a self-maintaining mechanism, in which the search terms and their performance are constantly evaluated. The scripts for the ‘brand terms’, ‘product terms’, and ‘generic terms’ ensure the proper division by traffic type. This makes it possible to make more targeted bids, which in turn makes it possible to realise higher ROAS and/or revenue targets. The scripts for bad-performing search terms improve the ROAS for the remaining search terms, which in turn allows for higher bids and increases the traffic for the terms even further. The Retry script prevents traffic from gradually decreasing by reactivating potentially interesting search terms. The entire structure is constantly balancing on the edge of profitability, which allows you to always get the most out of the search traffic.